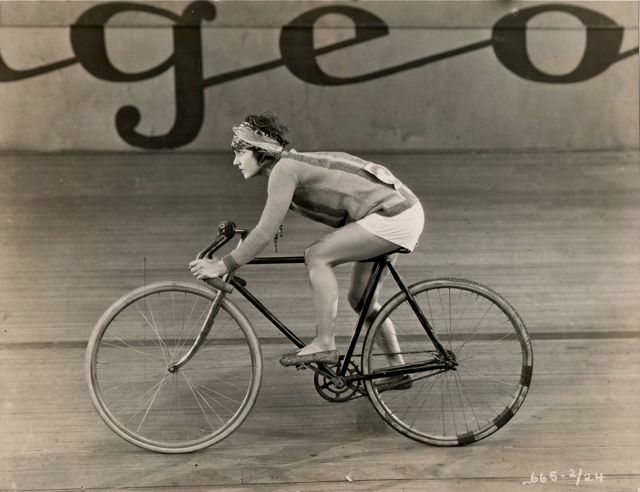 Viola Dana rides a bike – fast! Viola Dana wheels around the Cirque d’Hiver velodrome in Paris in a scene from the 1924 silent movie, Open All Night. The Brooklyn born actress appeared in more than 100 shorts and features from 1910 to 1929, but failed to transition successfully into talkies. Look for another Rides a Bike photo of Dana as she tricycles on the Cirque d’Hiver track!